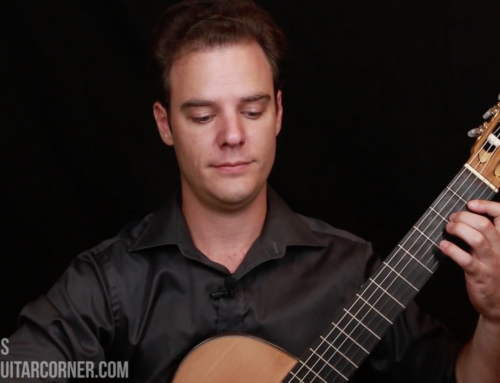 In level 1, we looked at the basic thumb free stroke on the classical guitar and how it is rather unique compared the other fingers. In this level we are going to add two very useful variations to this basic stroke. The thumb rest stroke, and using the flesh of the thumb. A rest stroke by the thumb produces a deep, full, and loud sound. These qualities will be useful to bring out bass lines in classical guitar repertoire and it is a valuable tool to add to your technique. The idea is essentially the same as with the fingers; the thumb passes through the string and rests on the string below. Depending on the shape of your thumbnail, you might need to rotate the right hand wrist a little so that the corner of the nail does not catch on the string. Alternatively, you might keep experimenting with the shape of your thumbnail so that you can execute both a free stroke and a rest stroke without changing the angle of your hand. Practice the rest stoke in isolation to begin with, and aim to develop a consistent sound along with a consistent movement. When you are ready, you can progress to playing a rest stroke thumb along with free strokes in the fingers. This poses a challenge in that the fingers will need to be completely independent of the thumb, and not affected in movement or sound. At first you might find your fingers making an accent when you play the rest stroke thumb, but persevere and aim to get full control of the thumb and the fingers. If free stroke and rest stroke take up the biggest pieces of the pie when it comes to thumb technique, the use of flesh is definitely the third biggest slice. By moving the thumb so that it is more or less parallel to the string, you will strike the string without actually using the nail to complete the stroke. The sound that this stroke creates is a very warm sound, with soft articulation. It can be used to great effect when playing an independent bass line or in certain styles of music that benefit from a “double bass” like sound. One octave scales starting on the 6th string using free stroke, rest stroke, and flesh. One octave scales starting on the 6th string using a mix of right hand thumb techniques. Both the flesh and rest stroke are covered in-depth in the Level 2 Technique & Musicianship Course in our membership packages!